In the heady aftermath of the 2006 Democracy Movement, new terminologies like ‘New Nepal’ and ‘Krambhanga’ (paradigm shift) were being bandied about to question Nepal’s established history, and images of unifying figures like Prithvi Narayan Shah or Bhanubhakta Acharya were questioned. Many got carried away by this typhoon of retroactive political correctness to question the whole historic base of the Nepali state. 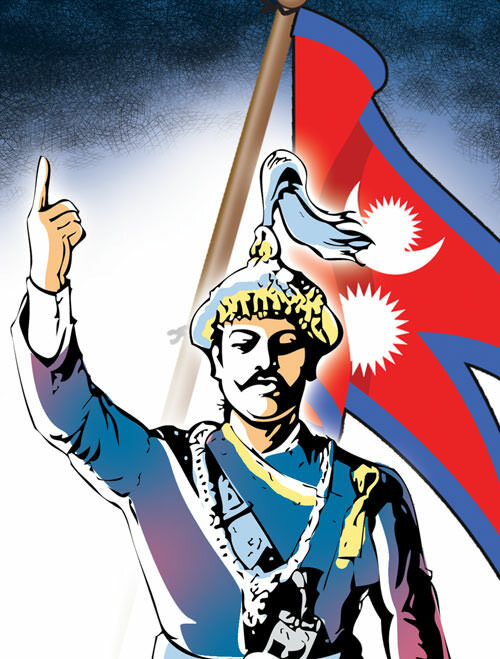 Prithvi Narayan, the founder of modern Nepal, forged a unified Nepal through military conquest in the 1760-1770 period. But in scenes reminiscent of China’s unsuccessful Cultural Revolution, his statues were brought down across the country. His figure outside Singha Darbar was covered in a shroud, perhaps because the new rulers of the republic couldn’t bear to be reminded of his accomplishment. Nepalis had been celebrating Prithvi Narayan’s birth anniversary as National Unity Day for decades. The new rulers, disciples of foreign philosophers like Karl Marx, Josef Stalin and Mao Zedong, decreed the banishment of the founding king from the holiday list. The so-called revolutionaries were so almighty that no writer, thinker or academic dared speak truth to power. A decade later, the government has finally corrected its mistake. National Unity Day was cancelled by the post-April uprising interim government led by the Nepali Congress (NC) in 2006. But a government led by the same party decided to reinstate the holiday on Thursday. A lot of water has flowed down the Bagmati in this period. NC leader Krishna Sitaula, who was Home Minister when unity day was cancelled, lost the election to a Hindu royalist. Maoist ideologue Baburam Bhattarai, who coined the term Krambhanga, is no longer a Maoist, and is now a friend of his ex-foes in the NC. Prithvi Narayan had his detractors, but the advocates of a unitary state have decided to reinstate him. The same people who tarred him as a feudal, exclusivist conquerer have now air-brushed him back into the history books. Prithvi Narayan Shah’s legacy underwent a rigorous test in the past 10 years. The truth is, he was neither just the founder of a dynasty, nor a colonialist. Whether we are royalists, leftists, democrats or republicans, we all share the history of South Asia’s oldest nation state. And for that, we thank a visionary leader and remember him. We dont trust a company with a turnover larger than Nepals GDP. Indian car-makers should be trusted to self-certify their products, just as the Koreans and Japanese are. Maoists are on an anti-school rampage, government is unable to provide security, and private schools are going to close. Arlene Blum is a scientist who climbs mountains. Read all about her adventures in her next book. As always, the budget will be predictable, and the economy, wildly otherwise.